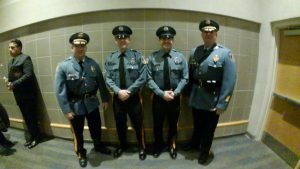 Press Release – AVALON POLICE DEPARTMENT N.J.
A team of assessors from the New Jersey State Association of Chiefs of Police (NJSACOP) will arrive on April 19 & 20th, 2019, to examine all aspects of the Avalon Police Department’s policies and procedures, management, operations, and support services Chief Jeffrey Christopher announced today. “Verification by the team that the Avalon Police Department meets the Commission’s “best practice” standards is part of a voluntary process to achieve accreditation recognition of law enforcement professional excellence”, Chief Christopher said. As part of this final on-site assessment, employees and members of the general public are invited to provide comments to the assessment team. They may do so by telephone. The public may call 609-967- 5904 on April 20, 2019, between the hours of 9:00am – 10:00am. Telephone comments are limited to 5 minutes and must address the agency’s ability to comply with the NJSACOP standards. A copy of the standards is available for inspection at the Avalon Police Department, 3000 Dune Drive, Avalon, NJ 08202. Please contact Administrative Sergeant Eric Heisman at 609-967-3411. Anyone wishing to offer written comments about the Avalon Police Department’s ability to comply with the standards for accreditation is requested to email the Accreditation Program manager at hdelgado@njsacop.org or write the New Jersey State Association of Chiefs of Police, Law Enforcement Accreditation Commission at 751 Route73 North, Suite 12 Marlton, N.J. 08053. 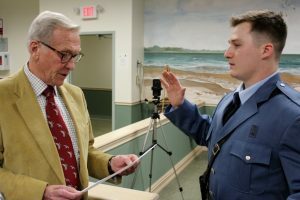 The Borough of Avalon welcomed new Patrolman Lukas Hill who was sworn in to his position by Mayor Martin Pagliughi during the Wednesday, February 13th meeting of Avalon Borough Council. Hill fills a position that was vacated by a recent retirement in the Department. 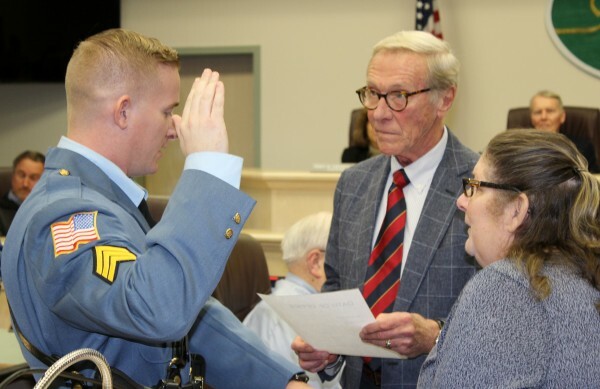 “Avalon residents consider the Avalon Police Department to be one of the best police departments in the State of New Jersey, and we welcome Lukas to our ranks”, Pagliughi said. “Lukas has many achievements in his young career and will be a tremendous asset to our public safety initiatives in the Borough”. Hill is a 2013 graduate of Cherokee High School, then attended West Chester University where he achieved a Bachelor of Science degree in Criminal Justice in 2017. In 2018, Hill attended the Camden County Police Academy at his own expense through the alternate route program. Hill currently resides in Sea Isle City, NJ. The Avalon Police Department is proud to announce that Ptlm. James Savini and Ptlm. Christopher Nazha have graduated the Cape May Police Academy on January 14, 2019 as part of the 45th BCPO. Ptlm. Savini was elected as class president for the 45th BCPO and took the Fire Arms Award for being the best shot in the recruit class. Ptlm. Nazha finished second for the Physical Training award out of 55 recruits. The Avalon Police Department is honored to have these two begin their careers! Ptlm. James Savini and Ptlm. 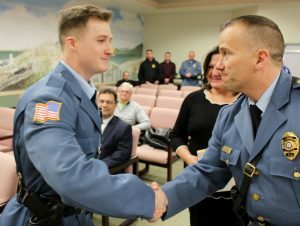 Christopher Nazha graduated from the Cape May County Police Academy, 45th BCPO on January 14, 2019. Ptlm. Savini was elected class president and was awarded the academy fire arms award. Ptlm. Nazha finished second in a field of fifty-five recruits in the Physical Training award. Stephen Bowers was sworn in as a new Sergeant with the Avalon Police Department during the Wednesday, December 12th, 2018 meeting of Avalon Borough Council. Bowers was hired as a Special Class I police officer in March, 2007. After working for two seasons, he was promoted to Special Class II police officer in February, 2009. Sgt. Bowers was hired as a full time patrolman in April, 2011. He currently resides in Swainton, NJ and is a graduate of Middle Township High School. The Avalon Police Department is seeking dispatchers to help supplement our existing dispatch corp. The position is an on call position paying $14.00/hour. Shifts are generally 12 hours. During the summer months(May through September) two dispatchers are on 24/7 with 3 dispatchers working weekends and holidays. 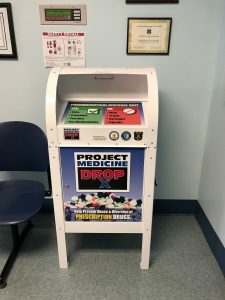 The Avalon Police Department installs New “Project Medicine Drop” Box to help residents dispose of unused medications and prevent prescription drug abuse. Members of the public are invited to visit the Project Medicine Drop sites and drop off any unused prescription medications anonymously and with no questions asked. Most Project Medicine Drop sites make this service available 24 hours a day, seven days a week, 365 days a year. The Medicine Drop Box is located at 3000 Dune Drive in the Police Department lobby. By giving residents of Avalon a safe and secure method to dispose of unneeded medications, Project Medicine Drop helps prevent the abuse of these drugs. This initiative also protects New Jersey’s environment by keeping these drugs out of landfills and out of the water supply. More locations, can be found at www.NJConsumerAffairs.gov/meddrop. 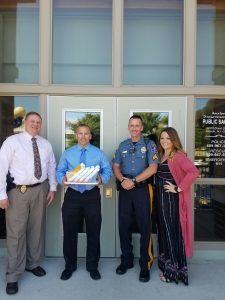 On Wednesday July 18, 2018 Margie Flannery dropped off 14 sunblocks (one for each car and extra for the station) to the Avalon Police Department. A few weeks ago her brother (a police officer in Harrison) came home with bad sunburn after working a traffic detail. Her sister, a melanoma survivor came up with the idea to supply police departments with sunblock in the hopes it would spread awareness and encourage departments to advise their men and women to wear sunblock at all times. Living by the shore, she had to get involved. She contacted Chief Christopher of Avalon PD and he was more than happy to be my first recipient. Thank you to my sponsors for your generous donations to this department and several others I am in the process of covering. Court House Fitness, Uncle Bills Stone Harbor, and Mary Kay. Pictured here are Chief Christopher, Captain Roscoe, and Sergeant Paluch. Protect yourself guys…while protecting others! Approximately 4 years ago, Sgt. Paluch’s wife Shelley passed away after a battle with melanoma. This is a topic that the Avalon Police Department feels strongly about. We also participated in the Run From the Sun 5k race, as part of Team Shelley, to help spread awareness. Thank you Margie for getting the word out!